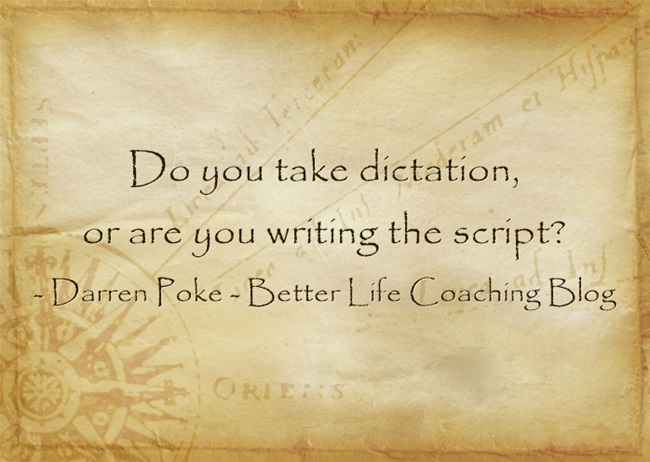 Do You Take Dictation, Or Are You Writing the Script? The remaining pages of your life, career and circumstances are yet to be written, and chances are that if you don’t take charge and write the script yourself, others will do it for you. Their intentions for your life may be noble, but the outcome won’t be as satisfying unless you take responsibility for your future. No one else can read your dreams. No one else can maximise your talent. No one else can tick off your bucket list. And your life goals and aspirations can’t be achieved while you’re spending all of your energy on someone else’s. Is your life’s direction dominated by the voices and ideas of others, or are you forging the path that God has laid out for you? Are you in control of how you spend your energy? Are you responsible for your current situation and your future success? If so, that’s awesome, but if not, it’s time to grab it back. Very good. I would have to say I write my own story, page, and chapter……..
Now I wouldn’t use the word dictation, suggestions, opinions, & advice I take and will always take into consideration.. If that makes sense to you. It’s always good to hear what other people have to say. Actually at one point in my life I hit rock bottom, where I lost everything including family, friends, employment, trust, self respect and I keep going. I had no one or anything to turn to. I seeked help and had the courage to drop my pride and ask for help.. I took everyone’s advice and suggestions nor did I want to but I had to. After some time I slowly got back on my feet and got my life on back track. So I would always take suggestions and advice, but I am the author of my own life and creator of my reality. Very good post.. Made me think a lot and have some more gratitude in my life today.